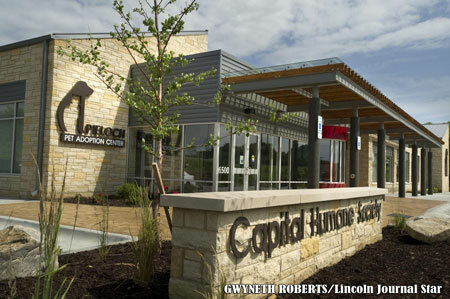 Our Pieloch Pet Adoption Center is located at 6500 S. 70th Street and is the adoption and education center for Capital Humane Society. Those interested in adopting a new companion can visit and interact with potential new pets at this location. The center is open Monday from 3:00pm-7:30pm, Tuesday through Friday from 11:30am-7:30pm and Saturday-Sunday from 11:00am-5:30pm. All adoptions and interactions end a half hour before closing. Our original location at 2320 Park Boulevard is where all animal admissions and assessments occur. Animals found by citizens, Lincoln Animal Control, and the Lancaster County Sheriff are brought to this location. Individuals who have lost their animal can look for their lost pet and reclaim them here. Animals being surrendered should be brought to this location. Business hours at the Admissions & Assessment Center are Monday-Friday from 10:30am-6:00 pm and Saturday-Sunday from 12:00-4:00 pm.